For those wanting to slow their busy minds before arriving in Tibet, the 48-hour train journey from Beijing is a zen-like way of doing this. The Qinghai-Tibet railway, which runs between Xining, the capital of Qinghai province, and Lhasa, the capital of the Tibet autonomous region, makes up the major part of the journey and authorities have been planning this project for a century. But it was only in 1984 that the first section of track - an 814-km stretch from Xining to Golmud - both in Qinghai province, was completed. The most amazing engineering feat occurred in 2001 when construction began on the 1,142-km railway between Golmud and Lhasa. The 30 billion yuan ($4.7 billion, 3.47 billion euros) high-altitude railway project employed about 100,000 engineers and construction workers for four years, and many staff had to use bottled oxygen and endure temperatures of minus 45 degrees. It is truly one of the engineering wonders of the world. The railway climbs from 2,829 meters above sea level at Golmud to 3,641 meters at Lhasa and it is crowned the highest railway in the world. More than 550 km of track is laid on permanently frozen earth and its highest point reaches 5,072 meters above sea level. Before the Qinghai-Tibet railway was built, travelers had to take a train as far as Golmud followed by a grueling 48-hour bus journey to Lhasa. Now there are direct trains from Beijing, Shanghai, Guangzhou and Xi'an. 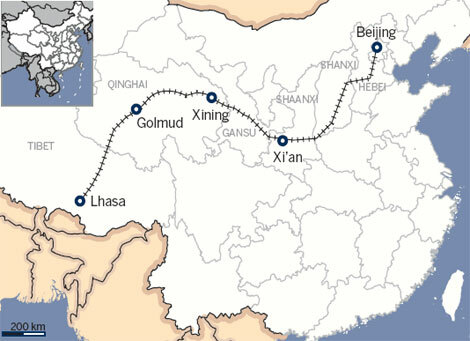 The Qinghai-Tibet railway is also reported to extend 300 km west of Lhasa to Shigatse and then all the way to Nepal. In Beijing, the T27 train leaves at 9.30 pm daily and arrives in Lhasa at 8.58 pm on the third day. It has 15 coaches and can hold 867 passengers at one time. There are three classes of tickets: soft sleeper at 1,189 yuan, hard sleeper at 766 yuan and hard seat at 363 yuan. In addition to a train ticket, foreigners need a special travel permit to enter the Tibet autonomous region, applications for which can be made at the local branches of China Tibet Tourism Bureau. A travel agent can normally handle this procedure. And once on board, travelers from all over the world can enjoy the trip of a lifetime. "It doesn't take long to discover that this train, in soft-sleeper class anyway, is a United Nations on rails. All of us, it transpires, are making this journey for the first time," Louise Southerden, a travel reporter from The Sydney Morning Herald writes. As the train trundles along, picturesque scenes of North and West China drift by. On the second day when the train leaves Xining at dusk, it rides onto the Qinghai-Tibet Plateau, an enormous highland 3,500 km across, with an average altitude of 5,000 meters. Previously running at a speed of 160 km/h on the plain, the train now slows to 120 km/h. Owing to the lack of oxygen at that altitude, oxygen-enriched air is pumped through all the carriages. Personal oxygen masks are also available. While smoking is not allowed as the oxygen-enriched air is highly flammable, there is no lack of gourmet choices. Classic Chinese cuisines such as stewed beef, fish filets in hot chili oil, stir fried shrimps with gingko nuts and Mapo tofu are served in the restaurant car. Passengers are told they should bring medication if prone to altitude sickness. But the views of the plateau more than compensate for any discomfort. Instead of farms, mines and the high-rises seen on the first day of your trip, whizzing by are flat plains and the snow-topped Kunlun Mountains. As the train enters the Qinghai-Tibet Plateau special sights can be seen. "There are prayer flags strung across glacial, fast-flowing rivers and streaming colorfully down steep hillsides; people dressed in chubas harvesting barley, or resting beside yaks harnessed to primitive ploughs; and stone walls around old stone houses," Southerden recalls of her trip. As soon as you catch sight of hordes of Tibetan antelope and yak, you are entering the area of Hoh Xil Nature Reserve, also known as the last fairyland of wild life in China. There are a total of more than 230 species of wild animals here, among which the Tibetan antelope is a unique species of China. Animals' migration habits are not disrupted as this stretch of the railway is built on a bridge of three to four meters high.